The Church of the Czech Lands and Slovakia is a self-governing body of the Orthodox Christian church that territorially covers the countries of the Czech Republic and the Republic of Slovakia. The primate was His Beatitude, Metropolitan Christopher of Prague and the Czech Lands and Slovakia, who was elected on May 2, 2006 until his resignation on April 12, 2013. Archbishop Simeon (Jakovljević) is currently the locum tenens until the election of a new primate is held. The Church of the Czech Lands and Slovakia presents both an ancient history as well as a very modern history. The present day church occupies the land of Moravia, where the brothers Ss. Cyril and Methodius began their mission to the Slavs, introducing the liturgical and canonical order of the Orthodox Church, translated into the Church Slavonic language. In doing this they developed the first Slavic alphabet. This mission was destroyed after Methodius died in 885, as Pope Stephen V of Rome forced all disciples of the brothers to leave the countryside which is now the Czech Republic. The Orthodox order survived in present day Slovakia due to its nearness and influence to Kievan Russia until the union with Rome was instituted by the Viennese Court. After the legal restraints to Orthodoxy were removed with the end of World War I, many people left the Roman Catholic Church. Many looked to the Serbian Orthodox Church as parts of the Serbian church had been within the pre-war union. Among those seeking the Orthodox church was a Roman Catholic priest, Matthias Pavlik, who had been interested in Orthodox Christianity for years. The Church of Serbia thus consented to consecrate Fr. Matthias as a bishop of the Orthodox Church with the name Gorazd. On September 25, 1921, Archimandrite Gorazd was consecrated Bishop of Moravia and Silesia at the Cathedral of the Holy Archangel Michael in Belgrade, Yugoslavia, by Patriarch Dimitri of Serbia. Bp. Gorazd (Pavlik) is considered to be in the succession from Archbishop Methodius of Moravia and bears the name of one of St. Methodius's disciples and successor, Bp. Gorazd. As the Orthodox leader in the new nation of Czechoslovakia, Bp. Gorazd laid the foundations of the Orthodox Church throughout Bohemia, Moravia, and into Slovakia. In Bohemia, he oversaw the building of eleven churches and two chapels. He also published the essential books for the conduct of church services that were translated in the Czech language. He provided aid to those in Slovakia and Subcarpathian Russia which then were part of Czechoslovakia, and who wanted to return to their ancestral Orthodox faith from the Unia. Thus, in the interbellum period, Bp. Gorazd built the small Czech church that during World War II would show how firmly it was connected to the Czech nation. As Hitler and his Nazis swept through Europe, a harsh rule descended on each nation. Czechoslovakia was no different as it suffered under the rule of Hitler's heir apparent, Reichsprotector Reinhard Heydrich. After the May 27, 1942, assassination attack on Heydrich's car near the Ss. 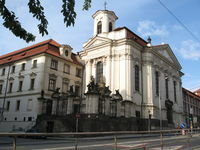 Cyril and Methodius Cathedral in Prague, Czech patriots took refuge in the crypt of the cathedral before continuing their escape. They were aided by senior church laymen, who kept Bp. Gorazd informed. However, their presence was discovered by the Nazis, and on June 18 the Nazis attacked their hiding place in the cathedral, killing them. The Orthodox priests, laymen, and Bp. Gorazd were arrested and killed by firing squads on September 4, 1942. In reprisal the Nazis forbade the church to operate in Bohemia and Moravia. Churches and chapels were closed, and a rounding up of Czechs was conducted, including the whole village of Lidice, whose inhabitants were either killed or sent to forced labor camps. For the Orthodox the whole church fell under the Nazi persecution and was decimated. A total of 256 Orthodox priests and laymen were executed, and church life came to a stop. After World War II the Orthodox Church in Czechoslovakia began its recovery without its beloved bishop. On December 9, 1951, the Patriarch of Moscow granted autocephaly to the Orthodox Church of Czechoslovakia, though this action was not recognized by Constantinople, which regarded the Czechoslovakian church as being autonomous under its authority. The Patriarch of Constantinople later granted a tomos of autocephaly on August 27, 1998. The martyrdom of Bp. Gorazd was recognized by the Serbian Orthodox Church on May 4, 1961, which glorified Gorazd as a New Martyr. Subsequently, on August 24, 1987, he was glorified at the Cathedral of St. Gorazd in Olomouc, Moravia. After the Czech and Slovak Republics separated into independent republics in 1993, activity continued in each country as separate legal entities: in the Czech Republic as the Orthodox Church in the Czech Lands and in the Slovak Republic as the Orthodox Church in Slovakia, but canonical unity was maintained as the Orthodox Church of the Czech Lands and Slovakia. The church is now organized into four eparchies divided into two administrative centers: the Metropolitan Council for the Czech Republic resident in Prague and the Metropolitan Council for the Slovak Republic in Presov. Under the Council in Prague are the eparchies of Prague and Olomouc-Brno, while the eparchies of Presov, and Michalovce are under the Council for Slovakia. After the repose of His Beatitude, Metropolitan Dorotheus of Prague and All Czechoslovakia, Archbishop Nicholas of Presov was elected the new metropolitan, and the church's primatial see was moved from Prague to Presov. Metr. Nicholas reposed on January 30, 2006, and was replaced by Archbishop Christopher of Prague and the Czech Lands (elected May 2, 2006). Metr. Christopher resigned in April 2013 amidst allegations of wrongdoings, and the present locum tenens is Abp Simeon of Brno and Olomouc, the senior bishop of the Church. In the Czech Republic, there are 82 parishes, with 51 in Bohemia and 31 in Moravia and Silesia. In the Republic of Slovakia, there are 69 parishes in the eparchy of Presov and 21 in the eparchy of Michalovce. The Orthodox Theological Faculty of the University of Presov provides an education for future priests of the combined Church. The faculty maintains a detached branch in Olomouc. The Monastery of St. Procopius of Sazava is located in Most, and that of the Dormition in Vilemov. This page was last edited on November 12, 2014, at 19:49. This page has been accessed 59,951 times.